Chris Griffin, SWD EIT, has always been driven to be reach the highest level at everything he does from playing in the NFL to building the UNIQUE Companies. Chris’s dedication to customer service and innate grasp of construction principles, thanks to his degree in engineering, allowed him to create a single company which is fully licensed as a general contractor, landscape contractor and swimming pool contractor. This UNIQUE combination is the only way for Chris to provide clients with a cohesive outdoor living space that offers the same function and flow they enjoy indoors. Chris has been in the landscape industry as a since 1998, and he is determined to continue to grow as a designer and a business professional. Achieving certifications and working with the latest technology lets Chris introduce his clients to cutting edge features for their outdoor living space and explain not only how the features are installed and how they function but also how they can enhance the enjoyment of each finished project. Chris’s ability to provide his clients with latest in outdoor living space design can only be achieved because of his ongoing commitment to continued education, desire to refine and improve construction processes and his understanding of structural integrity to ensure a safe finished product for each of his clients. 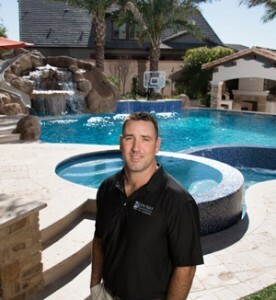 The added value that Chris’s design and engineering expertise brings to the UNIQUE Companies allows him to create outdoor living spaces that functions as an extension of your home and to increase your enjoyment of the Arizona lifestyle. In addition to balancing the demands of running a thriving landscape and pool business, Chris has found a way to balance his work responsibilities with his greatest passion, his family. He can often be found at football practice where he coaches his sons’ teams or with his daughter’s soccer team where he films their games. Time with his daughters is also spent swimming, camping, playing video games, reading or simply enjoying that special father daughter time. The value of giving back to the community is also a lesson that Chris believes is important to impart on his children. Chris also participates in and has served as chairman of the annual Walk to Cure Arthritis @ the Phoenix Zoo to raise funds for the battle against juvenile arthritis, which is a cause near to his heart. His leadership of this event has brought him national recognition. Chris’s continued commitment to meeting the needs of his family, his company and his clients is evident when you review his accomplishments and ongoing education. Stemple Project (view) – Amazing lazy river project in Gilbert! This Lazy River Project in Gilbert rivals the best showcased by popular amusement parks and luxury resorts. 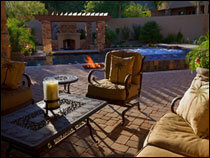 Kujansen Project (view) –Custom backyard in Chandler. A large outdoor living space where the home owners can BBQ, watch TV, entertain guests and a swim up bar that integrated with the swimming pool. Matson Project (view) – The Matson Project was a pretty sweet project,” Chris Griffin said, as he reminiscences about how his company—Unique Landscapes & Custom Pools—transformed an Anthem backyard into the spectacular outdoor spa and entertainment complex pictured here. Water, fire and glass were the dominating themes of this makeover. Metoyer Project (view) – Complete resort overhaul, front & backyard, pool/spa, huge ramada with gourmet outdoor kitchen, range, sink, granite tops, TV, bbq, etc. Pavers, travertine, desert landscaping, and an amazing lighting system. The Pentair Screenlogic system, intelliCHEM system, and Bullfrog Jet Paks make this amazing pool something extraordinary. Benefiel Project (view) – Incredible front & backyard in South Phoenix that contains an architectural pool & spa, sunken pergola, swim up bar, fireplace, fountains & more! This feature project has been used in many Unique Ads. Duchscherer Project (view) – Awesome Chandler backyard that sports a huge classic pool & spa, with lots of outdoor entertaining – ramada, outdoor kitchen, travertine pavers, firepit & more. Swagerty Project (view) – Incredible Ahwatukee backyard remodel project that transformed an outdated backyard into a spectacular showcase. Chris used all his construction skills to deal with many challenges to complete this project! It features some amazing views from the travertine patios, waterfeatures, fireplace, pergola & many other features. Wallace Project (view) – One of Chris’s first pool projects many years back, this project still looks incredible. This negative edge pool & marbella tile backyard required all of Unique’s skills to pull off. Today, its’ one of Unique’s feature projects.